Venezuela Spotlight: UM Study Finds More Stress among Migrants in Colombia than in U.S.
Once Latin America’s wealthiest nation, Venezuela is now an economic and political shell of its former self. As Venezuelans continue their mass exodus for survival, newly published research by a public health researcher and developmental psychologist at the University of Miami Miller School of Medicine, reveals surprising news about this population’s levels of self-reported stress in their new homelands. Seth J. Schwartz, Ph.D., presenting his research findings. In the first-ever research study of Venezuelan immigrants in South Florida and Colombia, Seth J. Schwartz, Ph.D., director of the Ph.D. Program in Prevention Science and Community Health in the Miller School’s Department of Public Health Sciences, and his collaborators investigated a question of cultural context: Do Venezuelan immigrant groups migrating to areas more culturally similar to their own report less discrimination, and a less negative context of reception, compared to immigrant groups settling in countries that are more culturally dissimilar? Their results showed that Venezuelan immigrants in Colombia reported significantly greater discrimination, a worse context of reception, and more depressive symptoms compared to their counterparts in the U.S. The full research summary was published in the November 2018 issue of the International Journal of Intercultural Relations. Dr. Schwartz and his collaborator, Christopher Salas-Wright, Ph.D., at Boston University, studied survey responses from 647 Venezuelan immigrants. The sample was divided evenly between immigrants surveyed in Bogotá, Colombia, and those surveyed in Miami. The majority of immigrants studied had migrated within one year prior to taking the survey. 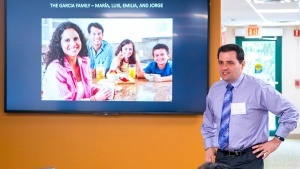 The study focused on individuals who were parents, because Venezuelans often migrate as family units. Participants were asked to report their feelings of perceived discrimination, negative perceptions of how they were received and viewed, and symptoms of depression and anxiety. Dr. Schwartz’s team collaborated with the Nuevos Rumbos Corporation to collect data on the Colombian side of the investigation. The findings suggest that mechanisms other than cultural similarity and dissimilarity may be responsible for the observed differences. • The long history of rivalries between Colombians and Venezuelans in trade, sports and politics. • South Florida’s status as home to large groups of Venezuelan immigrants since the late 1990s. The newer Venezuelans entering America may have existing connections and networks of support already in place. • The earlier Venezuelan immigrants to South Florida, who were highly educated business people and professionals. Their social status may have created a more positive pre-existing perception of Venezuelans for South Floridians. • The fact that the majority of Venezuelans entering Colombia are less educated and from lower incomes, creating an actual threat to low-wage Colombians for jobs. Dr. Schwartz added that the past two to three years represent the first time mass immigration of any kind has hit Colombia’s borders — a very different scenario than in the U.S.
Dr. Schwartz emphasized that the mass influx of low-wage and poor Venezuelans into Colombia — a country that has far less opportunities to begin with — has created fierce competition for any and all employment. Venezuelan emigres to the U.S. also are hitting hard times. Dr. Schwartz explained that many highly educated former professionals from Colombia lost their life savings in the Venezuelan economic crash. They fled to South Florida with nothing more than the clothes on their bodies, their belongings stuffed into suitcases. He added that the current American climate on asylum and shifting policies is making a bad situation worse. Many of the Venezuelans coming to America are applying for asylum and potentially facing deportation — a return to their homeland where inflation is above 1,000 percent and prospects are grim. The report was part of larger pilot study on the experiences of Venezuelan immigrant parents in the U.S. (Florida, especially Miami-Dade and Broward Counties) and Colombia (Bogotá, the capital city). So where do the social and psychological scientists wish to go from here? One of his own goals is to begin a formal lobbying campaign.